Occasionally, users might need to access their home computer when they are at work, even if it is only to access a few files. Rather than going home, copying the files on a USB flash stick then travelling back to work, one could leave the home PC on and access it using TeamViewer. TeamViewer is an intuitive utility that enables users to remotely connect to a computer, view its desktop and operate it as if it was their own. Furthermore, these functions are not limited to professionals alone, as the user-friendly interface also allows beginners to use it, even if they have not tested a remote utility before. Basically, in order to use TeamViewer, the app needs to be installed on both of the computers involved in the connection, and each of them get a unique ID and password. Whenever a user wants to gain control of the other computer, they need to input the corresponding ID and password, and they are connected. In other words, one can set up a remote controller, start a file transfer, or access a VPN, with anyone in the world. Another use for TeamViewer is setting up a presentation, that can be accessed be multiple users simultaneously, while granting them "read-only" privileges, so they cannot control anything on the host desktop. Moreover, TeamViewer enables users to create a list of computers to automatically control remotely , manage them, and even exchange instant messages. It should be noted that the speed and performance of the connection depend on the characteristics of the host computer, i.e. the faster the PC, the more stable the remote connection. Also, it is best to stop all the unnecessary applications in order to allow TeamViewer to use as much RAM as it requires. To sum it up, TeamViewer comes in very handy when a remote connection is needed, especially considering that it comes without any charge. · If you use TeamViewer you don't have to worry about firewalls: TeamViewer will find a route to your partner. 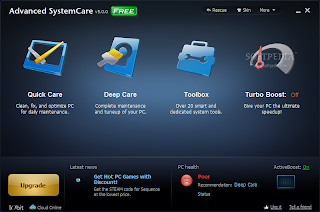 There are numerous software solutions that help users carry out regular maintenance of their PC, just to make sure everything functioning smoothly and that they will not be affected by errors when opening their computer. 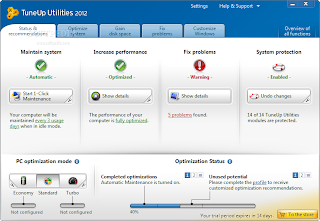 A popular application that can keep one's PC in good shape is TuneUp Utilities. Installing TuneUp Utilities can take a while especially if Custom mode is selected, as it guides users through the whole process thus allowing them to choose the elements that need to be installed. Within a few minutes, one can get a correctly configured utility ready to keep the computer fully functional. The interface is both well organized and user-friendly, which enables users to explore all the tabs with ease, especially since TuneUp Utilities is a complex application with tons of features and numerous tools for optimizing the computer. Each function is presented in a very pleasant and intuitive way. All major tools are grouped into tabs, while the Settings menu can be easily accessed from the top of the interface. Along with the optimization features, developers have also included a Windows Customization option so, besides cleaning the registry, removing broken shortcuts or accelerating the system shutdown, the user can also change the logon screen, the visual style or modify animations and effects. For beginner users, the 1-Click Maintenance function comes in handy, yet care is still recommended. Not only can they can do something wrong, but also TuneUp must be correctly configured to generate the best results, therefore it is the experts who can appreciate the true value of the software. To sum it up, TuneUp Utilities is, without any doubt, one of the best apps in this category, so paying a reasonable fee for keeping one's computer in shape and run it at maximum speed might turn out to be a good trade. Keeping your computer in top-notch shape requires some specialized software that can identify and fix existing problems and also take precautionary measures to prevent the occurrence of some of those issues. Advanced SystemCare aims to fulfill the needs of users who need to have their systems optimized and running as fast as possible. This application is not only supposed to help fix Windows problems, but also to tweak the existing settings so that the operating system can load and work a lot quicker. When installing this utility, you need to pay extra attention because the third-party software included in the setup may change the settings of your Internet browser. Once you get past this step, you will meet an eye-candy interface with modern elements that will guide you through the whole fixing and optimizing process. The main window provides access to the main functions of the application, so that you can immediately initiate a 'Quick Care', a 'Deep Care', start a so-called 'Turbo Boost' or enter the Toolbox. The two 'Care' parts have the power to heal your computer completely, but it's recommended to go for the more thorough one in order to spot any issue that might exist. Both of them run pretty fast, without putting a lot of stress on system resources, as we found out during our tests. Clicking the 'Toolbox' icon will open a whole new dimension, as it holds modules for cleaning, optimizing and repairing Windows issues. Of course, each of them comes with a short description, so the user will definitely know what every function is all about. Because power users will probably want to give their very own personal touch to the application, there's also a settings menu with all kinds of options, including one that concerns the overall look. 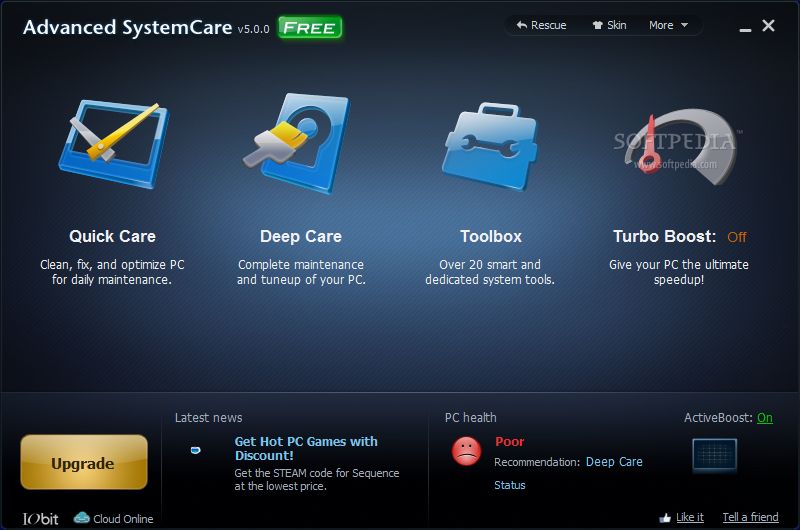 Advanced SystemCare comes with theme support, and beside the ones already included in the app, you can also find more online. 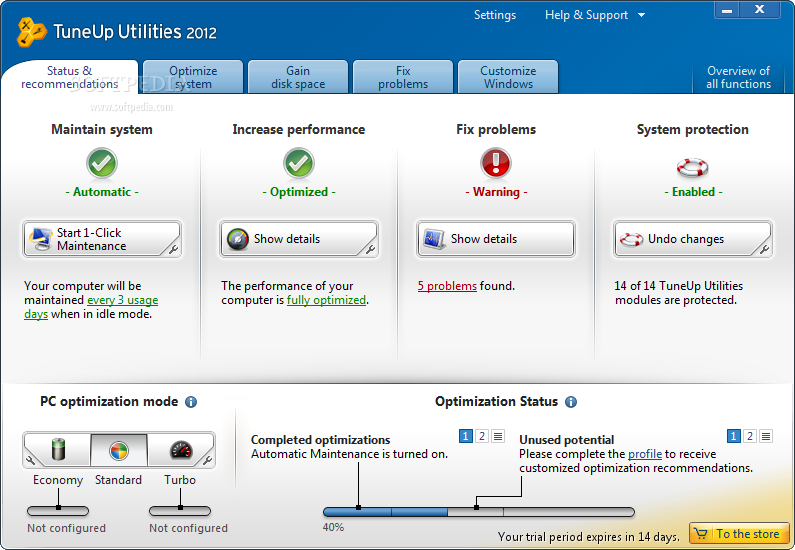 All in all, Advanced SystemCare is a great helper if there's something wrong with your machine. It will find all the performance issues and fix them in a few moments, but make sure to perform regular scans if you want to keep the system firing on all cylinders at all times.